for digital performances and media art. Inspired by various media approaches, Rekall addresses the difficulties encountered by artists when restaging a performance whose technology is now obsolete and by artistic teams when remembering technical and artistic choices that have been made from one residency to another. 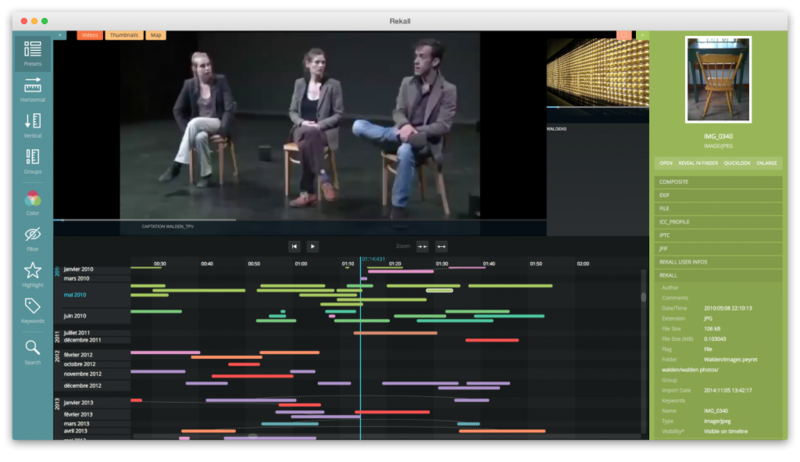 Another goal is to help art researchers with big data issues.Rekall is a software designed for all the performing arts (theatre, dance, music, circus, puppets, performance pieces, etc.) and for interactive installations. Rekall opens in a browser window (Chrome, Safari or Firefox) but do not need an internet connection. The analysis of the documents is made on your computer hard drive or an external disk. To develop Rekall as a webapp will allow us to design further features. Rekall is essentially based on performance records and allows digital performances to be actively preserved. Rekall can aggregate an infinite number of documents associated with one single work in various formats, and break down multiple timelines: creative process (e.g. research done on a specific aspect of the production), performance itself (even the multiple versions of a work in progress), and its reception (e.g. : by adding audio comments made by the company on its production, or of audiences, or press reviews). Rekall synthesizes the quantity, quality, and structure of documents in relation to one another, while closely adapting to each artist’s or company’s own processes. It can be used to identify and describe technologies used for the performance, to eventually define alternatives using different components.